A few years ago I used to sell a lot of my hand-crafted toppers on ebay. Been wanting to get back into it for a while, as I have a lot of products to use up and have bought some lovely new tools recently. Here are some toppers I have just listed (if you would like to bid please click on each of the photos). Last Monday I had a Stampin Up! Party at my house. The lovely Claire came and demo'd a lovely basket "make and take" and made kits with enough to make two cards for some of my friends who had signed up to doing a mini workshop. This was great as some of them aren't "crafters" at home, but enjoy doing it when they can. I ordered the Butterflies die and the Baby Blossoms set from the Spring supplement, and because my friends and my sis had placed orders I earned a lovely stamp set and a circles die and a butterfly stamp! Recently I bought some shrink plastic from Craft Obsessions, my son and I had played with it in the week to make a keyring charm. So this morning I made these earrings. I coloured in the butterfly image with Derwent watercolour pencils, shrunk it and put matched them with these amethyst beads. I've been wanting to play along over at Less is More for a while now, I've used Rubber Stamp Tapestry and Laura Ashley peg stamps and embossed the sentiment. Have to confess I stamped a couple of butterflies under the sentiment, one was not quite right so I had to rethink! DCM - The Darling Bugs of May! I'd like to see some BUGS eg ladybirds, bees, spiders, caterpillars, butterflies, dragonflies - it would be lovely to see them taking centre stage on your card or be used as a lovely embellishment but I won't accept them if they're just printed onto your backing papers as that wouldn't be a challenge at all! It was my turn to set the challenge on Salt this week. I choose the theme of Time, and as so often is the case, it was a very timely theme. As a team we have decided to stop the challenges over at Salt for now, however we will be keeping the blog on-line to continue being an inspiration and encouragement for anyone who goes there. You can read my thoughts HERE and see the other creations of the team. For the love of hexagons! Having recently picked up crocheting again, I've been gaining much inspiration from some great websites out there. Having started and not quite finished a granny square blanket for my son, I have been side tracked, completely distracted and have completely fallen in love with... the African Flower Pattern. It creates a lovely hexagon that can be turned into blankets, scarves, bags and jackets. I am using double knit acrylic wool and a size 4 hook. This is my creation so far, not sure what it's going to be. I imagine I'll keep adding to it when I'm not busy doing other projects. 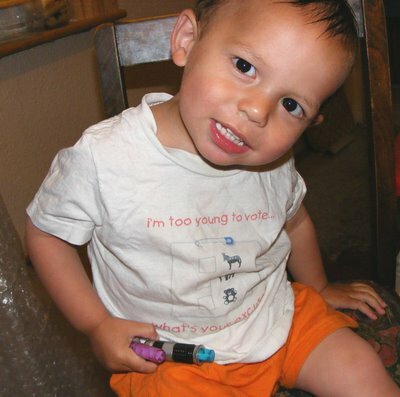 A pick of my youngest boy a couple of years ago, note his T shirt! These are my contributions to a bunting swap I'm taking part in on UKScrappers. The theme was "Here comes the girls". When I was first getting them together I had the panic feeling of "Oh Oh My Mojo Has Left the Building! ", then after I had stamped a bit, inked a bit and punched a few flowers out - it kinda all came together! There are too many ingredients to list, please comment if you would like to know about anything specific. My big little boy's first day at school! Son no 3's first day at school today! As we live in Wales, he can start full time school the term he is four. Methinks this is a tad to early, however he's a bright, bouncing boy who loves getting on and being with his friends, so I've conceded for him to go three days a week for half a term, today was his first full day. Here are the three boys this morning, my big boy is looking sulky as he wanted to get off to school and not wait for me to take pictures! Mae coming out to investigate! His teacher said he had a good day, although she did say: he's not like the other two! (Jadon is much more headstrong and she taught my first 2 boys).